Join our team at Pets Corner as we adventure into our new and exciting Grooming business! 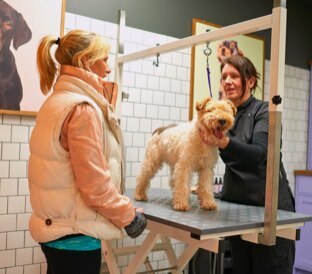 Grooming and styling all breeds of dogs to the highest standard. Overseeing the running of the spa in the absence of the Spa Manager. Ensuring first class spa presentation by our high level of house keeping and maintenance of equipment. Be passionate about animals and their welfare. Have experience of working in a busy salon or spa environment. Experience of working within a kennel, animal shelter or similar area is essential. Be confident with excellent handling skills. Possess outstanding customer service and communication skills. Pets Corner are an award winning, family run business with knowledgeable friendly staff, quality products that last and the best animal welfare policies in the industry. We are a growing company and following our acquisition of PamPurred Pets in April 2016, we now have over 160 stores nationwide. There couldn’t be a better time to join us as we offer some of the best career opportunities in the business. If you have excellent customer service skills combined with passion, a positive attitude, desire to learn and a love of all things pets, then we want to hear from you.